HI 93510N is a waterproof thermometer tailored for the lab and field. The LCD displays the highest and lowest readings in the cycle along with the current temperature. To freeze the reading for easy recording, simply press the HOLD button. Celsius or Fahrenheit range can be selected at the touch of a button. 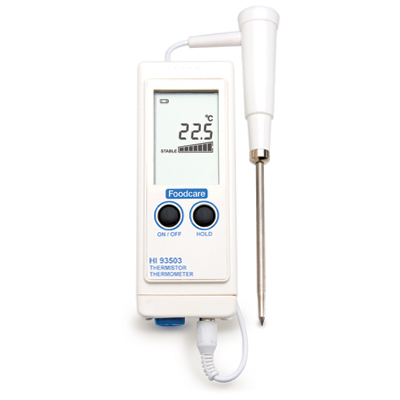 The HI 93510N also offers a CAL button to allow the operator to calibrate the meter and probe in an ice bath at 0°C. This will assure the removal of the combined meter and probe interchange error. 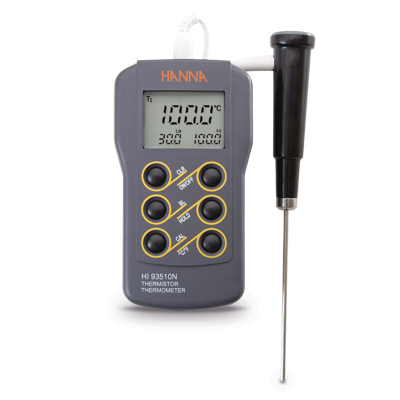 In addition to calibration capabilities, HI 93510N has a user-activated backlit display. A diverse assortment of HI 762 probes and cable lengths are available. Probes can be ordered with different handle colors to prevent cross-contamination. Advanced battery management features include a display of remaining battery power at startup, low battery warning and BEPS (Battery Error Prevention System) which alerts the user in the event that low battery power could adversely affect readings. HI 93510N is supplied with HI 762BL temperature probe, batteries and instructions.